Nearly 500 people, among them 85 civilians, have been killed in a week of fighting pitting Syrian rebels against the al-Qaeda-linked Islamic State of Iraq and the Levant, a monitoring group said Friday. "We have documented the killing of 482 people in the fighting - 85 civilians, 240 members of the rebel brigades and 157 members of ISIL," said Syrian Observatory for Human Rights director Rami Abdel Rahman. Among the civilians and rebels killed were 42 hostages who were executed in Aleppo by ISIL. Rebels also executed 47 ISIL members, mainly in Idlib province in northwestern Syria, Abdel Rahman said. 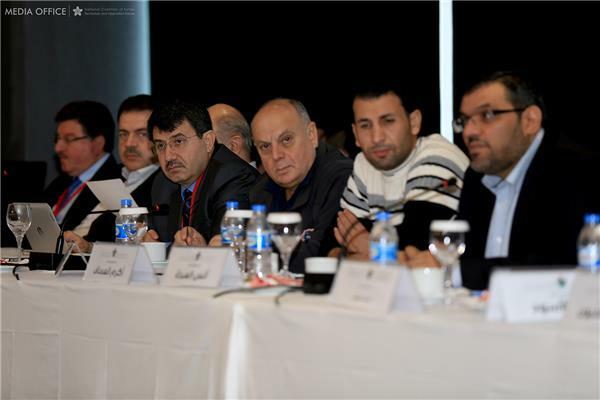 Representatives of Syrian opposition groups met for a second day of talks in the Spanish city of Cordoba on Friday. They're hoping to find common ground ahead of peace talks with the Syrian government set to take place in Geneva later this month. Those talks, known as Geneva II, will be the first time representatives from the government and opposition forces sit down together since the start of the conflict nearly three years ago. About 30 nations are invited to a day of speech-making planned for 22 January in the Swiss city of Montreux. 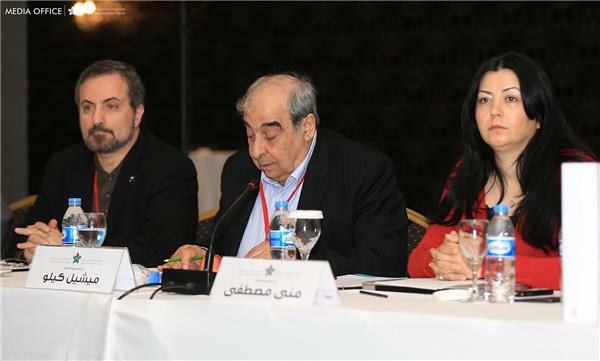 The talks in Cordoba are aimed at seeking an agreement on how to achieve a peaceful transition in Syria. Sheik Mohamed Al Yaqoubi, a Syrian Islamic scholar, said more than 120 representatives were taking part in the talks. "This is the first attempt to put them together," he said. "Most of them are not members of any political body or political entity in the opposition." Asked about the aims of the conference, he said they hoped to form "a body to follow up on civil issues", including sending letters to people inside Syria, as well as to the international community and those in refugee camps. Iran will not attend peace talks on the Syrian conflict due to take place in Switzerland this month, senior State Department officials said on Friday. There have been numerous reports of people starving to death in the neighbourhood. Chris Gunness, a spokesman for the United Nations Relief and Works Agency (UNRWA), told Al Jazeera that women were dying in labour due to malnutrition and that residents have been reduced to eating animal feed. UNRWA has called for an immediate humanitarian corridor to access the people trapped inside. [Updated Report] Aid agencies in Syria say a refugee camp for Palestinians in Damascus is facing a humanitarian crisis. The Yarmouk camp has been under siege for a year with thousands of people trapped with very little food or medicine. The UN Relief and Works Agency has called the camp a place of profound civilian suffering. The spokesman for a gathering of Syrian opposition groups said on Friday that an international conference on the country's future later this month should focus on establishing a time-frame for an end to the fighting. Yahya al-Aridi told the Associated Press in the Spanish city of Cordoba that the peace talks "should not go (on) forever. There should be a time plan." With the Syrian National Council, the main Western-backed opposition group, close to collapse and fighting between rebel groups reportedly killing hundreds, some 180 representatives of groups opposed to President Bashar al-Assad's government are meeting in Cordoba, southern Spain, to seek common ground. 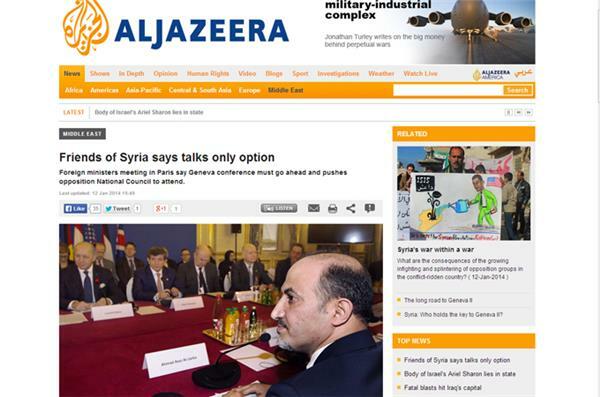 The so-called Geneva II conference on Syria is scheduled for January 22. Al Jazeera's Zeina Khodr reports from Beirut on what the advance of Syrian troops towards Aleppo means for opposition fighters. French Foreign Minister Laurent Fabius has said Syrian peace talks will go ahead as planned in Switzerland next week, but whether the main Syrian opposition group will attend remains uncertain. "Only a true political transition, putting an end to the present despotic regime... can lead to a true solution, and that is the aim of Geneva II," Fabius told a press conference in Paris on Sunday. 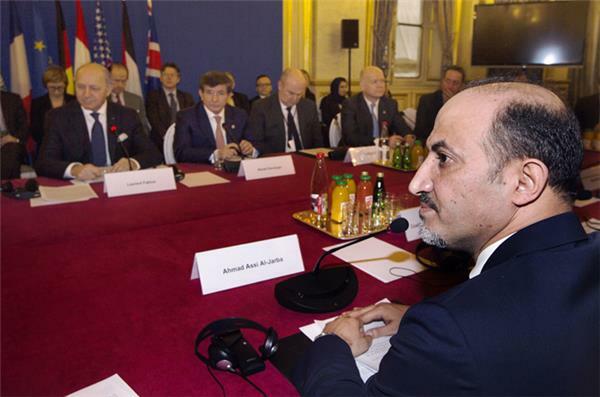 Fabius, with representatives from 11 other countries, including US Secretary of State John Kerry, attended the meeting in an effort to convince the main opposition group, the Syrian National Coalition, to attend the Geneva II talks. SNC President Ahmed Jarba didn't confirm whether his organisation would attend, but reaffirmed that Syrian President Bashar al-Assad must be removed from power. "The most important thing of today's meeting is that we are all in agreement that Bashar al-Assad has no future in Syria anymore," Jarba said. The Geneva II conference is set to open in the Swiss town of Montreux on January 22. The talks would be the first time since the war in Syria erupted in March 2011 that representatives of the Syrian government will sit down with the opposition to discuss an end to hostilities. 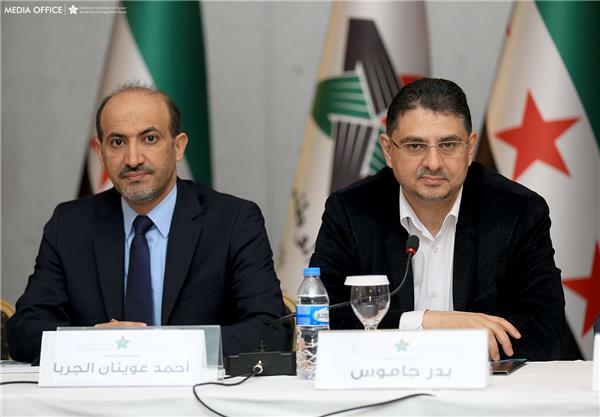 The Friends of Syria, an alliance of mainly Western and Gulf Arab countries who support the Syrian opposition, has said that the only way for a political solution to end the Syrian war is for peace talks in Geneva to take place. "There is no other political solution," French Foreign Minister Laurent Fabius said speaking on behalf of the group on Sunday. The video purports to show Syrian government bombing of the town of Khan al-Shih, in the southern countryside near Damascus. US Secretary of State John Kerry has said he is confident Syria's opposition National Coalition will attend upcoming peace talks in Switzerland. The bloc is under intense pressure to confirm its participation in the talks, scheduled to begin on January 22, and has said it will decide on the issue next Friday. The al-Qaeda-linked Islamist State of Iraq and the Levant executed dozens of rival fighters over the last two days as the group recaptured most territory it had lost in the northeastern Syrian province of Raqqa, activists said. Read Al-Jazeera's full report here. 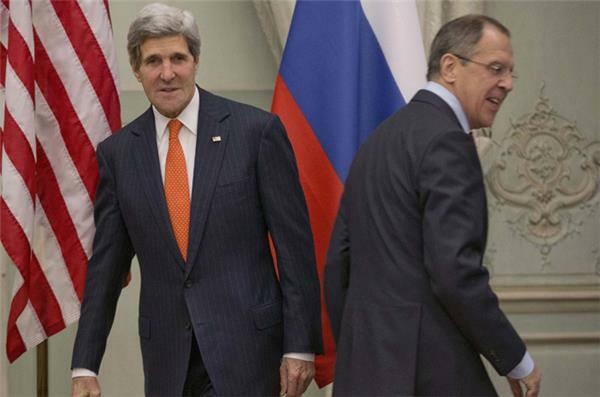 Paris talks included the possibility of ceasefires in parts of Syria and the opening of humanitarian access corridors. Britain said it planned to give the United States specialist equipment and training to help it destroy Syria's chemical weapons arsenal more quickly. Part of Syria's chemical stockpile is due to be destroyed on board a specially adapted US ship under an international accord engineered by Russia in the wake of a poison gas attack on the outskirts of Damascus that killed hundreds, including children, last August. British Defence Minister Philip Hammond said in a written statement to parliament on Monday his country planned to gift equipment to the United States worth around 2.5 million pounds ($4.12 million) that would allow the chemicals to be processed at a higher rate. "The US approached the UK to support this primary activity from our domestic industry as they would not have been able to procure the device themselves within the time-frames set," Hammond said. French President Francois Hollande said that 700 people had left France to join the fighting in Syria in what he called a "worrying" trend. Hollande said young people needed to be warned about the dangers of going to Syria and that France needed to "fight against a certain number of networks and havens that sustain terrorism". 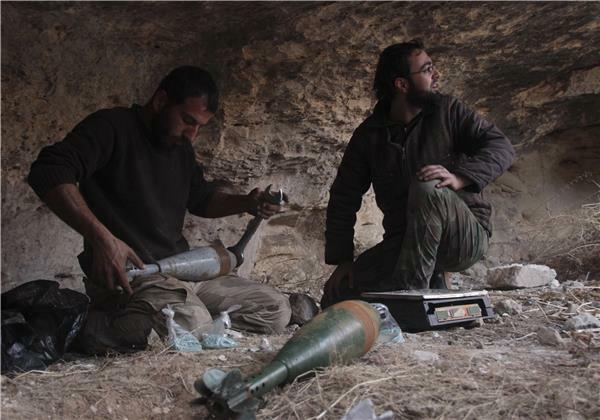 French officials have warned of the dangers from French citizens fighting with Al-Qaeda linked groups in Syria. 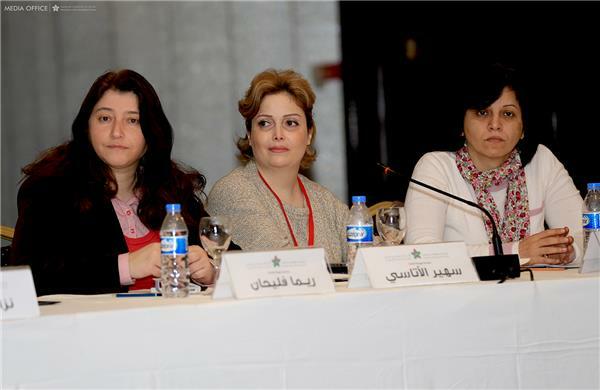 Charity organisations pledged $400m to help alleviate the humanitarian plight of Syrians affected by their country's civil war, participants at a meeting of charitable NGOs said. Kuwait's International Islamic Charitable Organisation said Kuwaiti charities pledged $142m on Tuesday, while dozens of NGOs attending the meeting promised the rest. The funds will target people inside and outside Syria, where more than 130,000 people have been killed and millions displaced during the 34-month conflict so far, IICO said in a statement cited by the KUNA news agency. 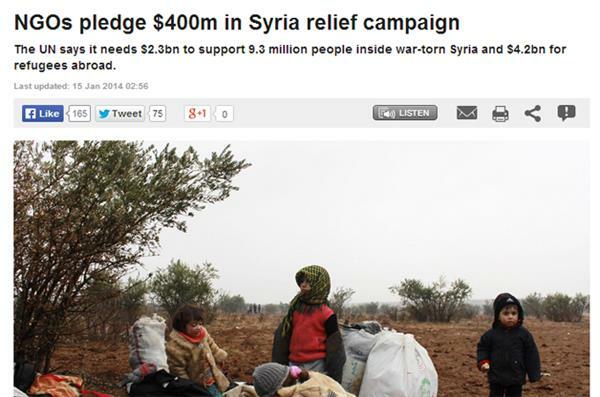 At a similar meeting last year, NGOs pledged $182m for Syrian refugees. 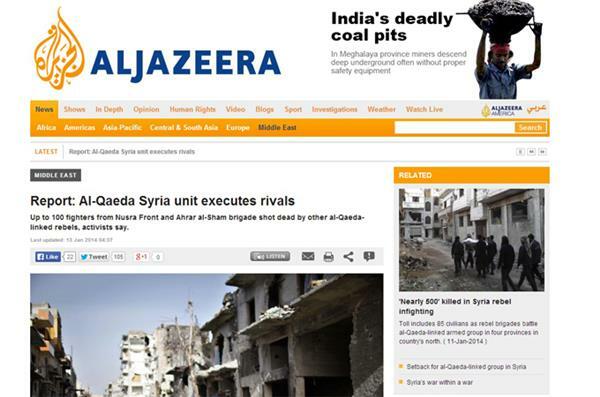 To read the full article on Al Jazeera's website click here. The intelligence services of some Western countries opposed to Syrian President Bashar al-Assad have visited Damascus to discuss security cooperation, Syria's deputy foreign minister said. 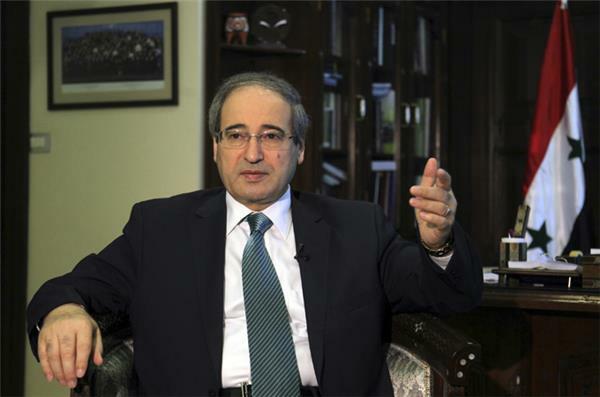 "I will not specify [which countries] but many of them have visited Damascus, yes," Faisal Mekdad said in an interview with the BBC on Wednesday, adding that there appeared to be a rift between the political and security authorities in some Assad-opposed countries. Western powers have supported the opposition with rhetoric, but have backed away from providing material aid. 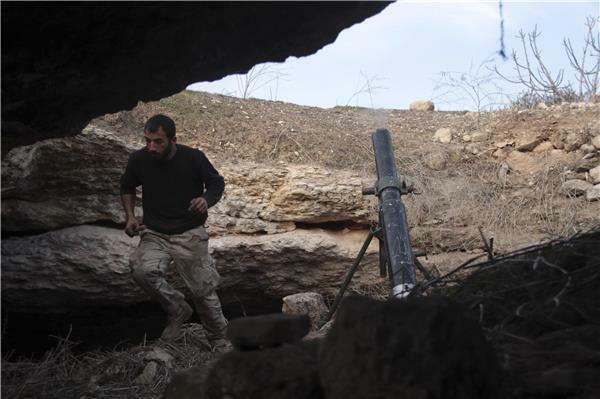 Syria plunged into civil war after an uprising against four decades of Assad family rule erupted in March 2011. The former British prime minister, Gordon Brown, talks to Al Jazeera about this plan as the UN's envoy for education to get 400,000 Syrian refugee children back into education. The plan comes during the Second International Humanitarian Pledging Conference, being held in Kuwait. 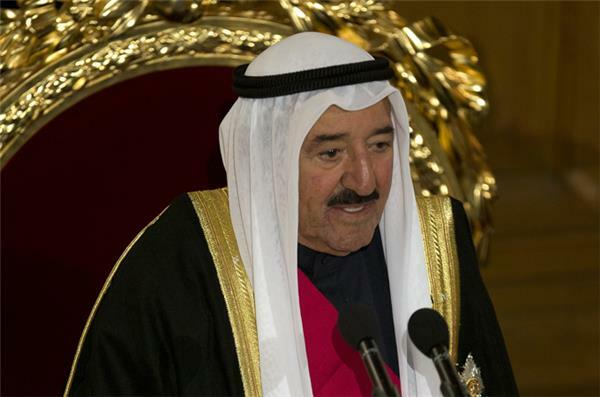 Kuwait's emir has promised to give $500m to United Nations humanitarian efforts in Syria, devastated by almost three years of civil war. Sheikh Sabah al-Ahmed al-Sabah made the pledge on Wednesday at an international donor conference intended to help the world body reach a $6.5bn aid target for the crisis in 2014. The appeal for aid, launched last month, is the largest in the history of the UN. 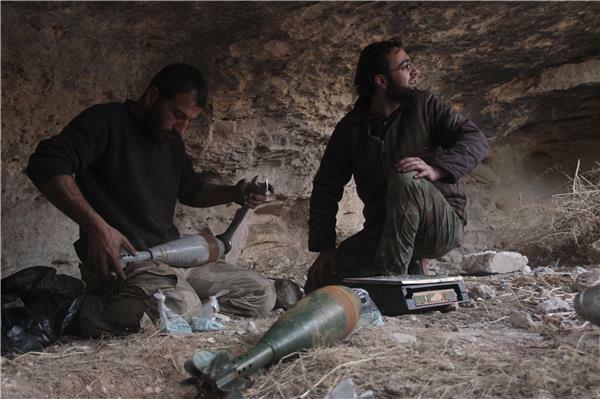 The UN estimates that the conflict has put Syria back by 35 years in terms of development. A Syrian activist group says two weeks of fighting between an al-Qaeda-linked group and other rebel forces in Syria has killed more than 1,000 people. The Britain-based Syrian Observatory for Human Rights, which has a network of activists around Syria, said on Thursday that the fighting in northern and eastern Syria killed 1,069. 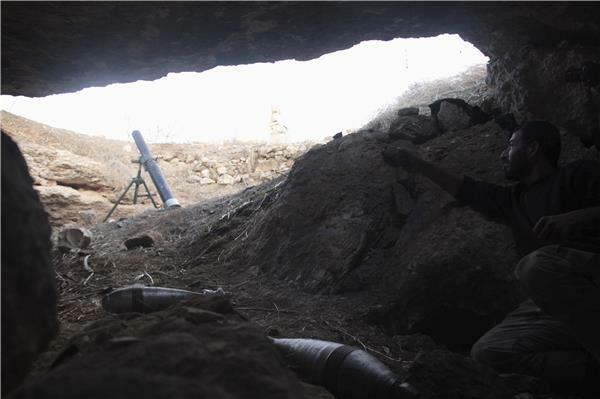 The clashes pitting the al-Qaeda-linked Islamic State of Iraq and the Levant and other groups are the most serious among rebel forces since the Syrian conflict began in March 2011. The Observatory said on Thursday that the dead included 130 civilians, including 21 who were "executed" by "Islamic State" members. 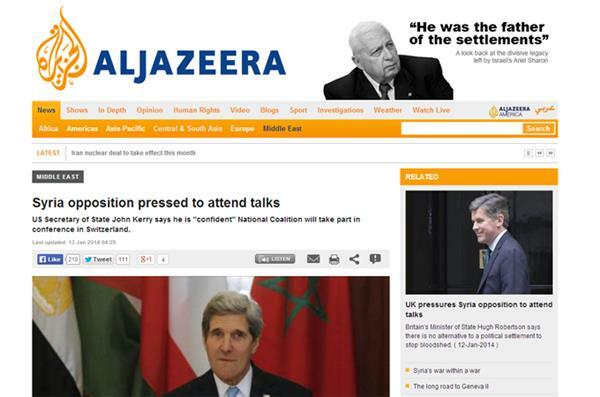 Al Jazeera has obtained a leaked document which may have a serious impact on the upcoming Geneva peace talks. I have examined your letter dated 06.01.2013 containing an invitation to the Arab Republic of Syria to participate in Geneva Conference on 22.01.2014; and I am pleased to inform you that Syria will take part in the Conference. Kindly find attached a list of names of the participating delegation together with other experts and the media representatives; while it should be noted that we do not agree with certain points mentioned in the letter, simply for the reason that they are in conflict with the legal and political position of the State of Syria; nor do they meet the supreme interests of the Syrian people. It remains as the priority to the Syrian people to continue to fight terrorism which undermines the existence of our people; to continue to drain the sources of terrorism; and we also demand the countries supporting terrorism to cease and refrain from funding, training, arming or harbouring terrorist groups in harmony with the International Law and the UN resolutions. Italy has revealed the name of the port that it has volunteered as the site for the transfer of Syrian chemical weapons. The first batch of stockpiles, which is on board a Danish ship, will be taken to the southern port of Gioia Tauro. U.S. Secretary of State John Kerry has said that Geneva II is "The only way to bring an end to a war that has created one of the world’s worst humanitarian disasters"
In his speech, U.S. Secretary of State Kerry urged the Syrian opposition to attend the talks in Geneva. 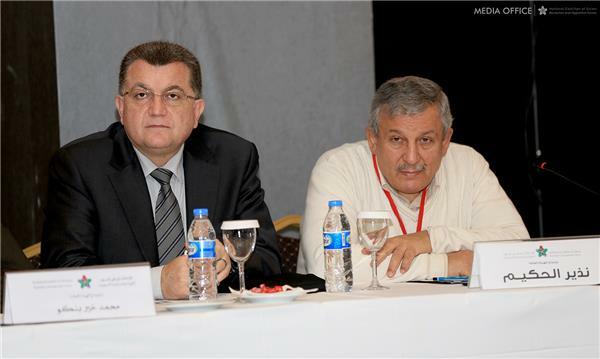 Syrian Foreign Minister Walid Moualem has handed Russia plans for a ceasefire in Aleppo. Moualem made the announcement on Friday at a press conference in Moscow, following a meeting with Russian Foreign Minister Sergei Lavrov. 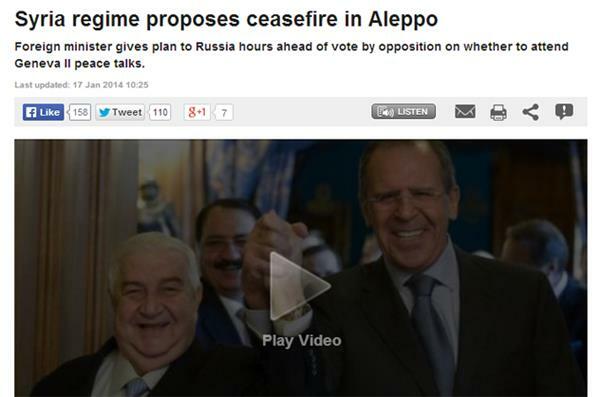 He also announced that Damascus is prepared to exchange prisoners with the opposition. "I informed (Russian Foreign Minister Sergei) Lavrov of our principled position in favour of an agreement to exchange those held in Syrian prisons for those taken by the other side," Moualem said. Opposition groups have taken control of the town of Saraqib in Syria's Idlib province, following a week of heavy fighting, according to Al Jazeera's Syria desk. Regiment 46 was the main base of the Islamic State of Iraq and the Levant (ISIL), an al-Qaeda-linked group, until opposition groups, including the Islamic Front, took it over on Friday. 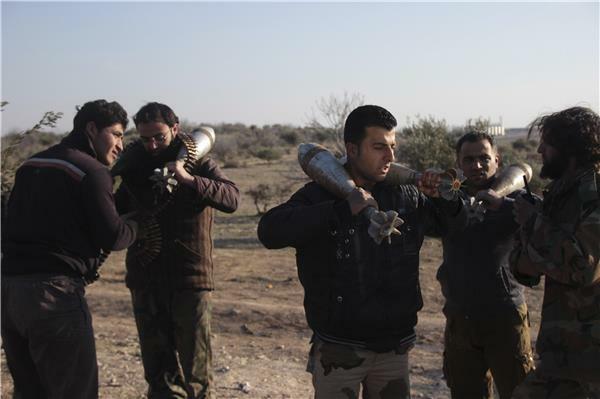 Activists said ISIL fighters have withdrawn to the northern town of Urum al Kubra. Syria's foreign minister has said he has handed Russia plans for a ceasefire in Aleppo, and was ready to exchange lists with rebel forces on a possible prisoner swap. 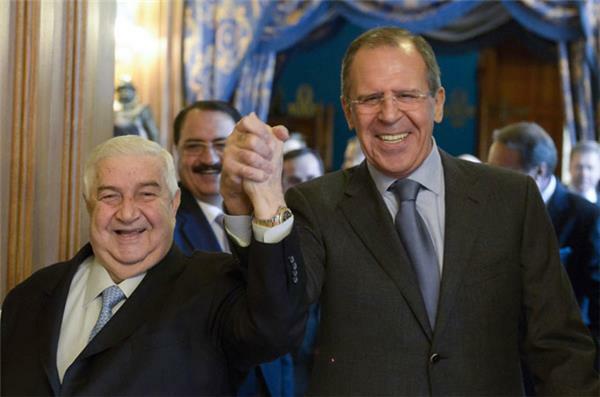 In a news conference on Friday in Moscow, Walid al-Moualem said he had handed his Russian counterpart, Sergey Lavrov, details of the ceasefire, plus plans for a prisoner exchange and the opening of humanitarian corridors in Syria. Syria's main opposition bloc, the Syrian National Coalition, is due to decide whether it would participate in peace talks scheduled by the Un next week in Geneva.Al Jazeera's Paul Brennan and Anita McNaught report. 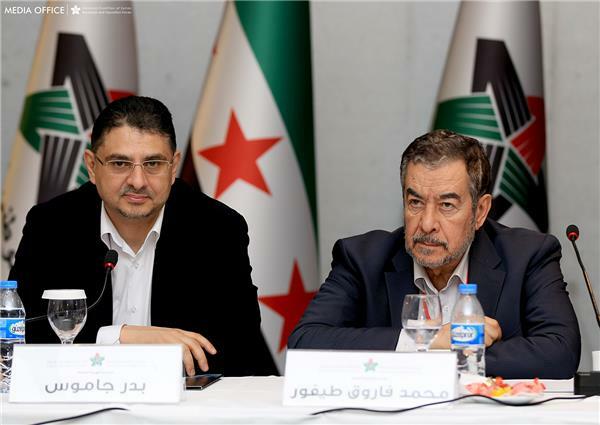 Another legal tangle for #SNC : Founding Constitution stipulates no meeting w/ Assad regime. Some say Geneva2 can't happen unless changed. #SNC Khalid Saleh says any #SNC mission to Geneva2 is clear: They go ONLY to discuss formation of transitional governing body. Nothing else. #SNC legal committee itself is split over whether ¾ or simple majority necessary for Geneva2 participation. #Syria . Renato Bellofiore, Gioia Tauro's mayor, is concerned about the ship carrying the first stockpile of chemical weapons from Syria. Formal talks finally underway at #SNC meeting. Geneva2 vote timing? Anyone's guess. Crucial input ex Ankara where armed factions meeting. 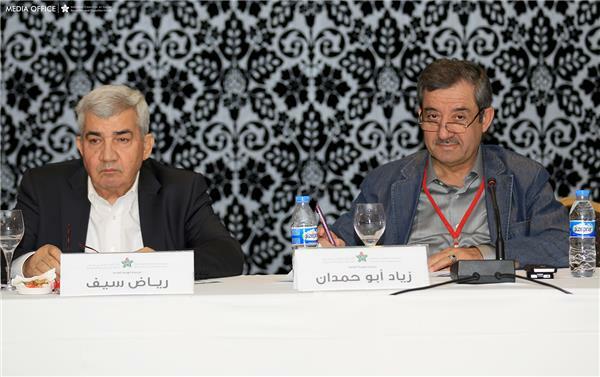 Seventy representatives of the 120-member Syrian National Coalition met on Saturday (January 18) to hold discussions on whether to attend international peace talks due to start on Wednesday (January 22) in Switzerland. Earlier this week, 44 members said they would boycott meetings of the Syrian National Coalition (SNC) and would not attend the Geneva 2 peace conference that are set to start in Montreux on January 22. 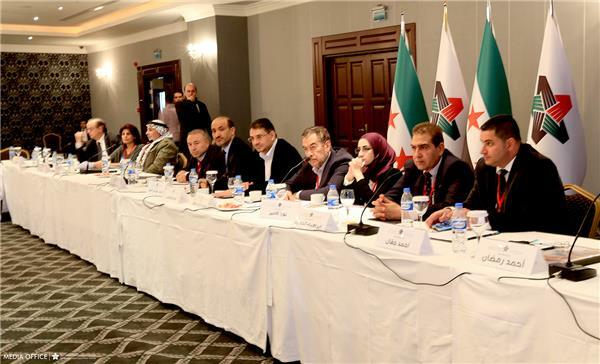 The SNC, which is backed by Western and Arab powers, began a delayed meeting in Turkey on Friday (January 17) to decide whether to take part. Its discussions resumed on Saturday and it remained unclear how or when they would reach a final decision.